This is a case study with a difference. There are no sheds, photographers and very little framing. The shed becomes a small, art gallery; the photographer a young mum with an eye for artwork; framing? .. learning the basics to know what works well, but then sub-contracting that out. And all of this is set in Switzerland...a long way from Beaconsfield and DIYframing, you might think. In fact, Sharrin Joos was one of two students who joined us from Switzerland for our Business Development Week at Beaconsfield in the Summer of 2006. The framed, stretched canvas that she produced during the Framing Fabric course features on our web-site to this day. 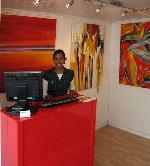 The idea of selling artwork at affordable prices, was something that had appealed to Sharrin for some time. After leaving South Africa for Scotland in 2001, having 2 children and being a "stay at home mum" for 4 years, she was desperate to try something different. She was able to source artwork at good price and thought that there must be a way of turning it into a business. However, presentation is important and paintings just on canvas are not easily marketable. That was when she decided to find out how to do framing. The intention had been to open a gallery in Edinburgh, but after extensive research it was clear that there were a number of issues which needed to be sorted for it to be a risk worth taking. Anyway, within a year the family moved to Switzerland. Far from that being an end to Sharrin's grand plan, the idea of opening a gallery was firmly rooted. At the same time as coping with living in a new country, getting to grips with French as the main language and the challenges of school times for her children, she was still determined to develop a business that would be flexible enough to conform to her new life. Being in the right place at the right time always helps; for Sharrin it was spotting empty shop windows in a local village that she loved to visit. Talking to the owner revealed that there were no clear plans for the property. After a bit of constant pestering over the next few weeks, he relented and let Sharrin have a 1 year lease as a trial run. 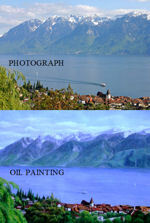 La Petite Galerie is situated in the old port town of Lutry, on the shores of Lac leman, near to Lausanne. The main focus at the moment is to sell artwork. Framing skills have been important because all of the canvases have to be stretched and mounted. 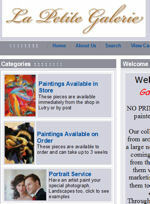 The gallery also offers a service where people can have their photographs turned into oil paintings on canvas. Once that takes off, then will be the time to take the framing service further. In the meantime, the framing equipment is kept simple so that funds can be prioritised and spent on marketing and advertising ... that's the next big effort. In fact basic materials for framing, such as mouldings and mountboard, like most things in Switzerland are expensive, so with the small amount of framing needed at the moment it is more cost effective to use a local framer. This is still a new venture so there are a lot more ideas to run with. For a start there is a large ex-pat community which Sharrin has every intention of targeting, at two large fairs, catering especially for that group. Quite rightly, Sharrin feels pretty chuffed that she has managed to start her own business and in a country where speaking the language (French) remains her biggest challenge. In spite of the culture shock, life is pretty good for her and her family, with every day feeling like they are on holiday. She still remembers the buzz of making her first sale (a three piece painting) from the gallery and that also gives her the encouragement to keep going. Any advice for beginners? One: make sure that if you intend to work abroad, being able to understand what people are saying is helpful. Two: watch out for start-up costs they have a nasty habit of quickly mounting up. Three: get organised but keep it clear and simple. Finally, if you are pestered by, "Cheeky men seeking exotic women", always pretend you don't understand the language. Not that many of us at DIYframing have had the same problem as Sharrin in that last point (although those of you who have met us won't be massively surprised). But Judy says she totally understands!